United Nations University ,Tokyo, Japan approved and acknowledged the operation of a Regional Centre of Expertise (RCE-Tirupati) on ‘Education for Sustainable Development’ under the Chairmanship of Prof.R.Ramamurthi. The Foundation is being launched at Orion Hall of Hotel Pai Viceroy on Oct 1st 2015 at 7.30 pm .The Guests of Honor are Sri Chadalawada Krishnamurthy Chairman TTD, Tirupati, and Mrs. Bhagyashri Dingle Chairperson of Plan India, New Delhi and Dr. G.R.S.Rao Chairman AGS, Tirupati .The centre is operated by the Chairman Prof.R.Ramamurthi in collaboration with Academy of Gandhian Studies. 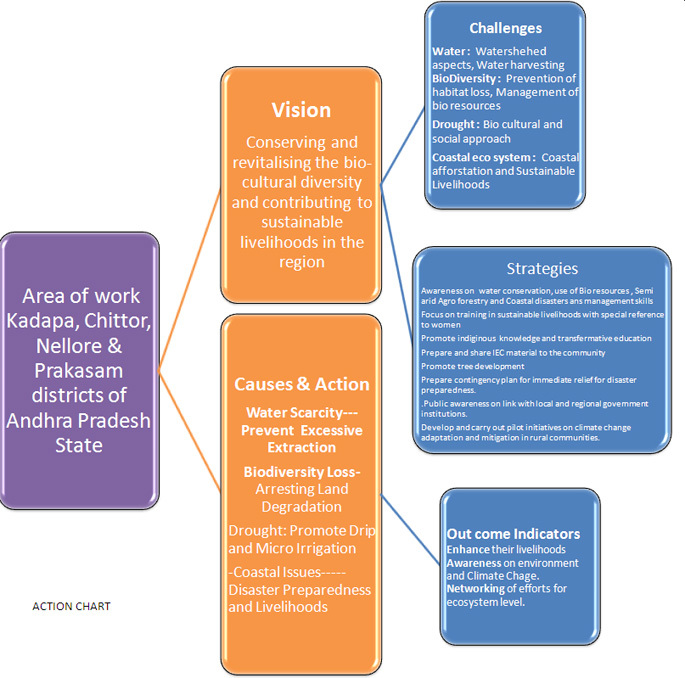 The centre has a large number of coalition working partners to deliver the agenda of sensitizing students, rural communities and coastal communities through innovative transformative learning modules about the importance of Water, Bioresources, Livelihoods and survival skills to tide over coastal challenges. *The main contact person has authority and responsibility to communicate with UNU-IAS regarding the RCE, for instance to designate your representative(s) at conference. The alternate contact is a person to succeed the authority and responsibility when the main contact person cannot communicate with us. 2-1. Please briefly describe the region including environmental, socio-cultural, demographical, economic and educational characteristics. The region selected comprises two districts of Chittoor and Kadapa which are strewn with mountains, valleys, forests, plains with agricultural lands and two coastal districts of Nellore and Prakasam with farm lands, wetlands, shrimp farms and islands with a total population of 13.2 million. There are 10 universities, 200 colleges in the area. Tirupati zone in Chittoor district is very special region because of flux of 20,000 to 50,000 people per day visiting the shrine up the hill at Tirumala. The area is rich in cultural diversity with artisans and artists. The tribal communities are present in all the districts. The two coastal districts have rich marine biodiversity and are prone for storm surges and tidal waves. This was part of Tsunami hit region The states of Telengana and Andhra Pradesh have no RCEs so far. 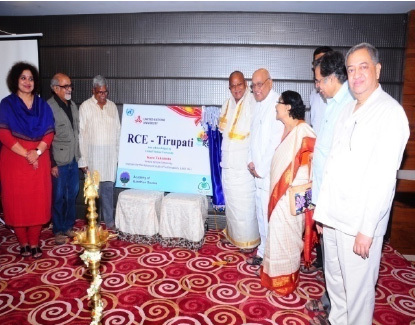 If RCE-Tirupati is started it might in future cater to the extended region . 2-2. Please attach a separate sheet of two maps: (1) the map showing the location of the region in the context of country or continent and (2) the map that delineates the geographical scope of the RCE. 2-3. Please state the reason for this geographical scope selection for your RCE. The region selected has homogenous physical features as mountains and forests The methods of agriculture and horticulture are pretty much similar. Occurrence of periodical drought is also common for the entire region. The areas of Nellore and Prakasam districts are coastal and have unique features of aquaculture and coastal biodiversity in wetlands and islands. Drought, forest biodiversity are shared by all the districts. Socio-cultural character of coastal belt is different just as biological resources. While the issues of land degradation and its impact on biodiversity is a shared feature, problems of human- animal conflict are found mostly in Chittoor and Kadapa districts. Disaster preparedness is a requirement only in coastal districts of Nellore and Prakasam. 2-4. Please describe the major sustainability challenges of the region. 1. Social and Ecological Stress in Tirupati zone due to pilgrim flux. 2. Urbanization Issues are Water, Energy, land degradation and habitat loss. 4. Excessive Developmental priorities due to Special Economic Zones on the coast has impacted the mangroves and coastal biodiversity which in turn affects vulnerable fishing commonalities. 3-1. Please identify and briefly state the RCE vision which encompasses consideration of the three pillars of sustainability – economy, society and environment. Lack of flow of fruits of science and Innovations to all sections of Society. 3-2. What are the long and short-term objectives of the RCE? 4-1. Please briefly explain how multiple stakeholders have been mobilized to develop the RCE. During a series of seminars and consultations the idea of strengthening of institutions for promoting Education for Sustainable Development emerged and gets further mobilized. 4-2. please list the names of key institutions/organizations of the RCE and select the type of institutions from the drop-down option. Please indicate (check ) whether they have already committed to the RCE initiatives or are still considered potential stakeholders. 4-3.How does the RCE secure and manage financial and personnel resources to promote RCE activities? 8. Some partners of network have committed to provide logistic and human resources. 4-4. 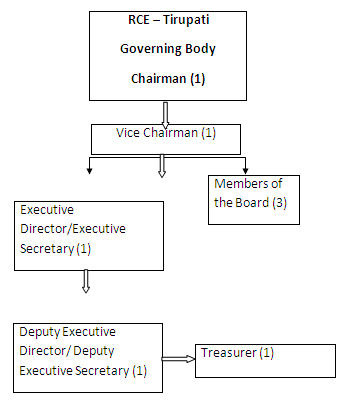 Please briefly describe the management structure of the RCE with lines of authority and responsibilities. 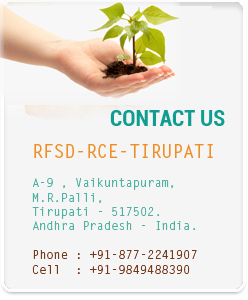 Please also specify the secretariat of the RCE. Executive Director is the nodal officer. Chairman and Executive Director will be accountable and responsible for all activities. For the present Chairman's office is the Secretariat. 4-5. Please give a brief explanation of the monitoring and evaluation mechanism of the RCE. How do the multiple stakeholders interact in various joint/collaborative activities? A Scheme of distribution of work has been developed involving stakeholder/ partners in different districts based on their capabilities and experience for individual/joint and collaborative activities. The overall coordination of the activities will be done on rotation basis among the major stakeholders namely B: ACCESS, AGS, SARDS, JAGRITI. Please list the main ongoing and planned activities of the RCE: (1) activities specific to individual organizations (your RCE stakeholders) and (2) collaborative and coordinated joint activities of the RCE. Specify the organization in charge and describe the activity with a few keywords (i.e. environmental education, capacity building, rural development, research and development (R&D), transformative education, etc).